Be the first to share your favorite memory, photo or story of Osvaldo "Cuba". This memorial page is dedicated for family, friends and future generations to celebrate the life of their loved one. 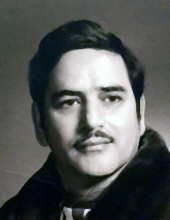 Osvaldo “Cuba” Rodriguez, 90, of Perth Amboy, passed away on Monday, November 6th. Born and raised in Santa Clara, Cuba, Osvaldo came to the United States in 1971 and made his home in Perth Amboy. For many years he was the owner of a grocery store on State street in Perth Amboy, before becoming a restaurateur. He owned two restaurants, “The Spanish Restaurant” on Smith Street and later, another Spanish style restaurant on Hall Avenue, both in Perth Amboy. He was a very giving man who would often feed people who could not otherwise afford to pay for their meal. He retired in the late 80’s but his passion for cooking kept him in the catering business for many years to come. He was a member of Second Home, a senior and adult day care in Perth Amboy. He was also very devoted to St. Lazarus. Predeceased by his eight brothers and sisters and a son-in-law, Justo Figueroa, Jr. in 2008, he is survived by his daughters, Carmen Rodriguez-Rojas and her husband Robert, of New Brunswick and Nancy Figueroa and her companion Dennie Norman, of Ewing. He also leaves behind many good friends and extended family. Funeral services will begin at 9:00 AM Saturday morning from Zylka Funeral Home, 513 State Street, Perth Amboy, followed by a 10:00 AM Liturgy in the Funeral Home. Interment will follow at Alpine Cemetery, Perth Amboy. The family will receive friends on Friday from 4:00 to 8:00 PM at the Funeral Home. In lieu of flowers, donations honoring Osvaldo’s memory may be made to St. Jude’s Children’s Research Hospital at 262 Danny Thomas Place, Memphis, TN 38105or online at www.stjude.org/donate. To send flowers or a remembrance gift to the family of Osvaldo "Cuba" Rodriguez, please visit our Tribute Store. "Email Address" would like to share the life celebration of Osvaldo "Cuba" Rodriguez. Click on the "link" to go to share a favorite memory or leave a condolence message for the family.